Hi! My name is Sheri Graham. I have been a wife and homemaker for over 27 years now and I love to help and encourage other women. Over the years, I have learned a lot about being intentional, being organized, and getting systems in place. Now I want to come alongside you and give you the nudge you need to get the essential systems in place in your home so your home runs smoother. Encouragement - Join a group of ladies who pray for and encourage one another as we strive to be all God wants us to be! Accountability - Have some goals you want to work towards (exercising, eating healthy, devotional time, etc.)? Join accountability groups to keep you motivated! Friendship - Build friendships with other ladies who are in the trenches too! Coaching - Need some help with a homemaking, homeschooling, or family topic? 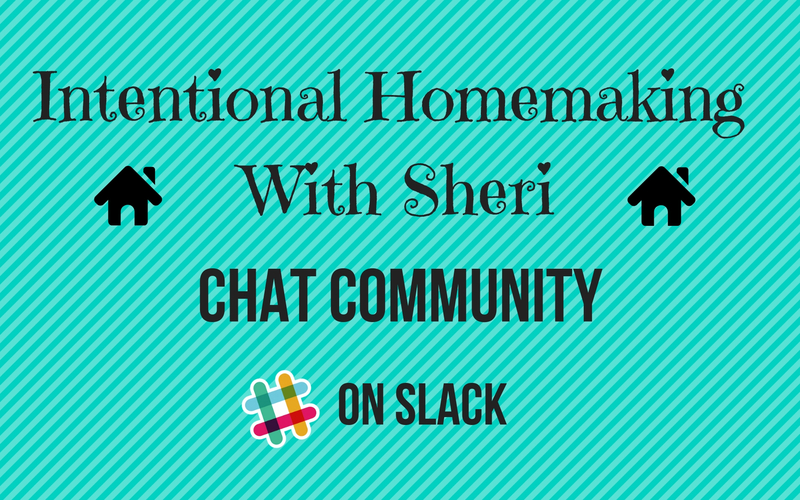 Sheri is in the chat community daily to help, along with other ladies who share their experiences! Community - God made us for community. We need each other. In this chat community we will enjoy learning, growing, and praying together! "I LOVE this chat group! The community feeling from the other women is wonderful! They are all so nice, encouraging, uplifting, and caring. We pray for one another about real concerns, and I appreciate that so much. God has already been answering some of my prayers because of these sweet ladies’ prayers! I also like the various channels you can choose to join (or not) depending on what you want to get out of the community. I think I joined them all because I’m enjoying all the areas of support. However, if someone only wants or is interested in help or support in a few specific areas, they can join those and not be bothered with the rest. This community of ladies is great! Thank you, Sheri, for making such a place for all of us." "I’m loving this group! The encouragement and motivation is amazing, and everyone is so kind and supportive. It’s refreshing to have a place where people genuinely care about and uplift one another, and it’s fantastic to be able to be honest and open about our struggles without worrying about being judged or put down. We can be “real” here, have fun, and be encouraged too. Thanks, Sheri!" "The chat group is an amazing gathering of women who genuinely care and are very encouraging to each other. I was hesitant at first because I’m pretty quiet in chat type settings and usually the women aren’t what you hope it to be. I am so glad I tried it. These woman are simply amazing, it’s great to see the encouragement, excitement, concern and etc when we reach goals set or even when we might be feeling yucky or sore and don’t want to do things. So many chat topics to follow that is a great part of this woman's day. I’m excited to see others' progress and general getting along and chatting that is hard to find today. Such a positive environment!" If you are interested in joining our community . . . Please read through the Terms & Conditions so you understand how the membership works. Once you have determined that this membership is right for you, then click "Subscribe" to join us today!